« Fun Spanish games – keep the kids entertained and help them learn Spanish! Mandarin Chinese is the most widely spoken language in the world. Learn to speak this popular language and you will be able to communicate with more people worldwide. By 2020-2030, China is set to become the world’s largest economy, therefore, if you can speak Chinese you will be able to tap into a growing market, develop good business relationships and gain a huge competitive edge! Read on to discover 10 great reasons to learn Mandarin Chinese. By learning a non-alphabetical language, such as Mandarin Chinese, you are opening your mind to a new way of thinking, showing potential employers you are interested in improving your personal development and are knowledgeable about future cultural and economic trends. 2. Improve your cultural intelligence. Language and culture are intertwined so by learning the Chinese language you will also get to know a whole new culture and way of life, far different from our day-to-day lives in the Western world. Enrich your understanding of East Asian cultures by learning about their impressive cuisine, music and ancient history. 3. China’s economy is the fastest growing in the world. China’s economy is booming! China is currently the world’s largest car market and energy consumer. Chinese incomes are rising and people have more disposable incomes. If you can speak even a little Chinese, you will be able to expand into this growing market, increase your profits and competitive advantage. 4. Impress potential employers, colleagues, friends and family. Who do you know that is learning Chinese? Stand out amongst your acquaintances and impress them with your newly acquired knowledge! An excellent addition to your CV. 5. Chinese can be easier to learn than European languages. You don’t have to learn the Chinese characters to be able to speak it. Speaking Chinese is much easier than writing it. Anyway, there is a method of writing Chinese using the Roman alphabet. Also, there are no subject/verb agreements, no plurals, no conjugations or tenses and the numbering system and time expressions are simple. 6. If you like a challenge, learning Chinese is for you. Learning their writing system is quite a challenge, providing great intellectual stimulation. The beauty of the language is in the writing and there is a system to its design. 7. Create exciting travel opportunities for yourself. China is an amazing country to visit. If you can speak even some of the language you will be able to get around much easier and get much more out of your trip. You would be able to eat in more typical restaurants for a more authentic eating experience. Although they teach English in schools, you will rarely find someone in the street who speaks English. 8. Easy to learn a little to get by. You don’t have to spend years learning all of the complex elements of the written system. Like any European language you can just learn a few key words and phrases to get by. If you like art and drawing, learning to write the Chinese characters will appeal to you. You will learn to increase your artistic abilities by “drawing” the graphic aspect of the language. The graphic component of the language makes it easier for people with dyslexia to learn and memorise words. 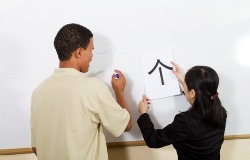 VLS is now offering 1-to-1 Mandarin Chinese and Japanese lessons with a talented and passionate tutor. If you would like to find out more about learning this increasingly popular language, call Fiona on 07870699404 or contact us via the website.